This infrared image shows the dust ring around the nearby star HR 4796A in the southern constellation of Centaurus. Called SPHERE (for Spectro-Polarimetric High-contrast Exoplanet REsearch), the new alien planet detection tool was mounted on the European Southern Observatory's Very Large Telescope Unit Telescope 3 in the Atacama Desert last month. Using space- and ground-based telescopes, astronomers have detected more than 2,000 exoplanets since spotting the first ones back in the 1990s. But scientists have rarely been able to look at these worlds directly because the weak glow of a planet is often outshined by bright light from its parent star. Instead, astronomers often use indirect techniques like the transit method, in which they look for telltale dips in a star's brightness caused when a planet crosses in front of the star. To be observed directly, planets usually need to be very large and very far away from their parent star. The first confirmed direct photo of an alien planet in 2010 showed a world eight times the mass of Jupiter that orbited its host star at from more than 300 times the distance between Earth and the sun. SPHERE is designed to get the highest contrast possible in a small patch of sky around a star to see exoplanets that might otherwise be hidden. To boost the contrast in its images, SPHERE uses adaptive optics to correct for the blurring effects of the Earth's atmosphere as well as a coronagraph also blocks out starlight. This infrared image of Saturn’s largest moon, Titan, was one of the first produced by the SPHERE instrument soon after it was installed on ESO's Very Large Telescope in Chile in May 2014. SPHERE's first shot, taken in the infrared wavelength, shows the dust ring around the nearby star HR 4796A, which is in the southern constellation of Centaurus. Though it doesn't show a planet, the clarity of this disc demonstrates SPHERE's impressive ability to reduce the glare from a star, ESO officials said. ESO also released near-infrared images that SPHERE took of an object much closer to home: Titan, Saturn's largest moon. The near-infrared wavelength can penetrate Titan's thick atmosphere to allow astronomers to probe the moon's surface, which would be invisible in the visible spectrum. Another instrument in Chile designed to directly image exoplanets snapped its first photos within the last year. 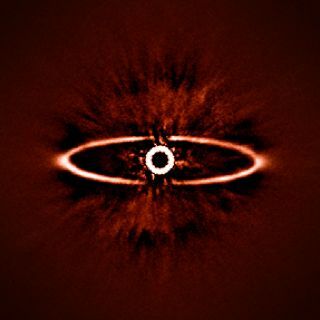 The Gemini Observatory's Planet Imager, installed at the 8-meter Gemini South telescope, had its first light on Nov. 11, 2013 and took photos of a planet orbiting the star Beta Pictoris.